Article marketing, by the means of sharing on social networking sites is a vital step. Article sharing starts with sharing your content on your own social networks. But as you blog grows it all starts becoming a hectic task to share every article that you publish. Especially when the frequency of your articles per day is high. Publishers using feedburner can easily bypass sharing on twitter with a simple functionality provided by feedburner. 'Socialize' allows a feedburner RSS publisher to auto tweet his newest submission on any desired twitter account. To make your article more discoverable on twitter, hash tag are used. While auto tweets via feedburner can automatically add has tags depending on the posts. How and what is added as hash tag? 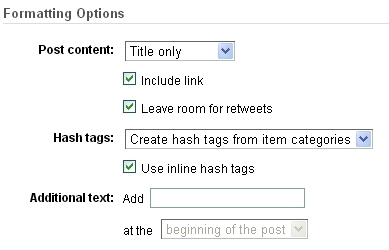 There is a simple option that when selected automatically adds your category or tags (in Blogger) as hash tag. Step 1: How to enable auto tweet? Select your blog from the list. Navigate to 'Socialize' option in left sidebar. Step 2: Adding twitter account? Click 'Add a Twitter account' button. A new window will popup, sign-in with your twitter account you want to use. After authorization you will get redirected back to feedburner. NOTE- You can add more than one twitter account, but unfortunately you can select only one to use. Bloggers or publishers also have page on Facebook, connect Facebook page with twitter to auto-publish Facebook page status to twitter. All feedburner tutorials can be accessed here. The links tweeted are shortened by Google's URL shortner. So, you can also track how many times your twitter link was clicked.